my first Cookie Swap! 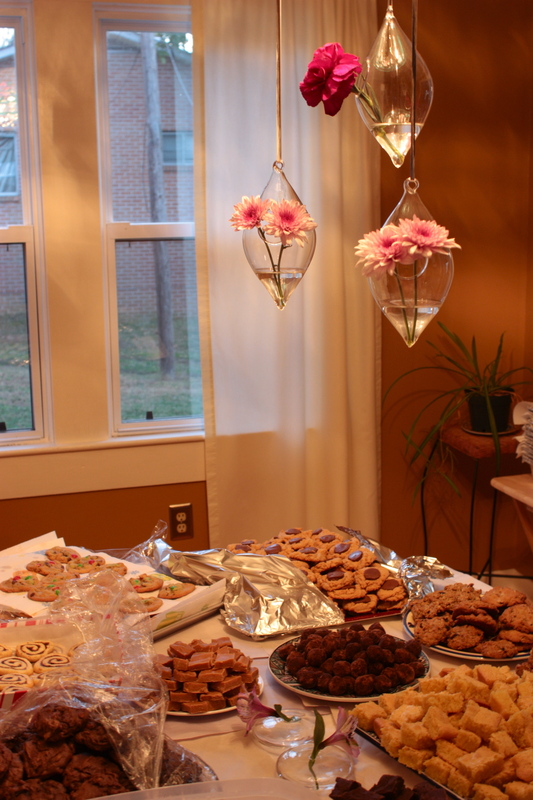 | "Il faut goûter"
Thanks, fabulous Debbie, for hosting my (and several other attendees’) first-ever Cookie Swap! It goes like this: you make several dozen awesome cookies. Everyone else makes dozens of their version of awesome cookies. 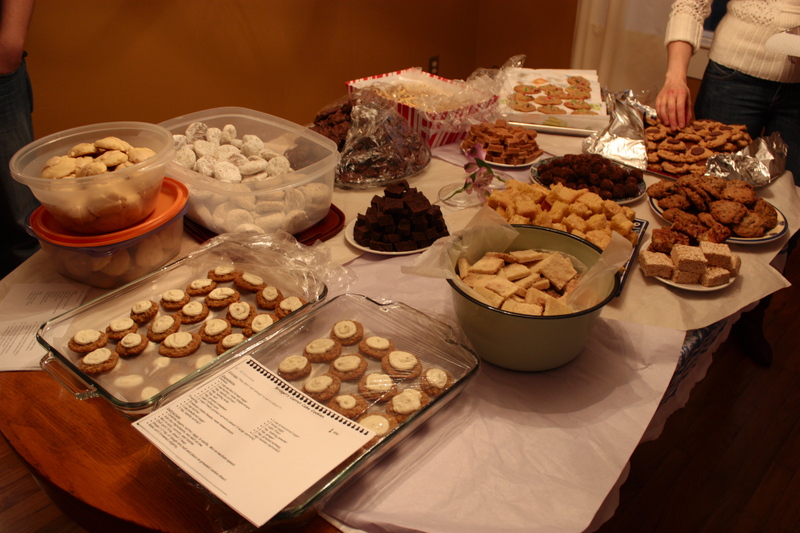 All those cookies make quite a spread upon a table where all are free to marvel and nibble-sample. Then you are provided with containers to fill with all these new glorious cookies, plus copies of recipes. In the end, your kitchen counter is filled with quite a varied bunch of cookies, ready for holiday drop-ins and delightful homestyle tea and coffee dates! 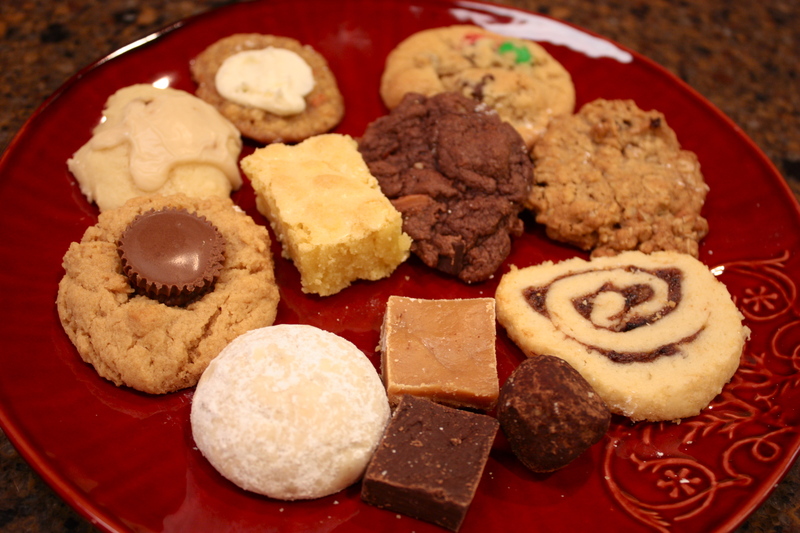 Cookie Swaps are an excellent holiday idea, and not just for Christmastime I think! Debbie has a lovely new house--and I loved these hanging vases! One of each treat from the Swap! My contribution to the cookie swap was a first-time recipe I found on a blog called, ironically, Allison Eats (it was a sign). 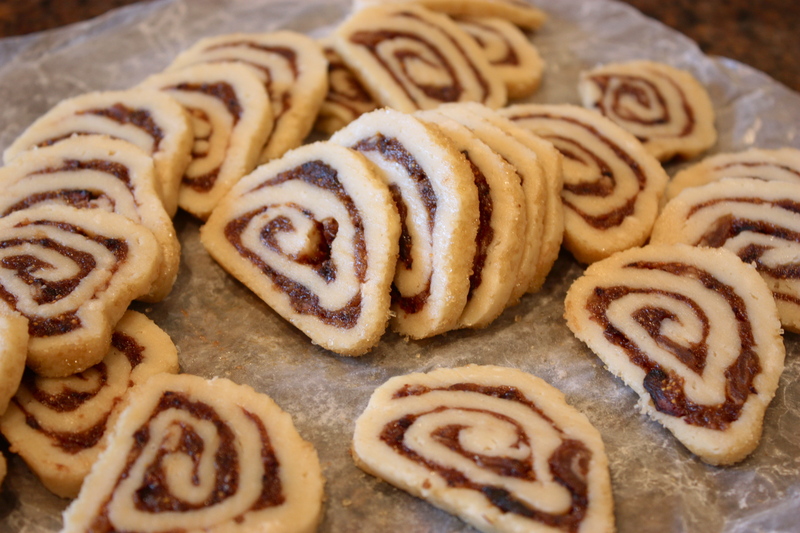 I made Anise-Scented Fig and Date Swirls, and I was well pleased with them. The fragrant dough is paired with a sweet mixture of figs and dates, creating a unique flavor combination and a moist cookie reminiscent of a Fig Newton. I told the other bakers I’d post my recipe here, so I hope they didn’t search for it before I got around to posting–you know, after my morning full of coffee, Christmas decorating, and COOKIES! I hope you all are so lucky to attend a cookie swap–Heck, host one yourself! And thanks again to Debbie and all you other nice people I met and chatted with (I’m enjoying your cookies!). 1. In a blender purée figs and dates with water and 2 tablespoons refined sugar. 2. In a bowl, whisk together flour, anise seeds (if using seeds), baking powder, baking soda, and salt. 3. In another bowl with an electric mixer beat together butter, cream cheese, and remaining 1/2 cup refined sugar until light and fluffy. Add vanilla, anise extract (if using), egg yolk, and flour mixture and beat until a dough forms. Form dough into a disk. Chill dough, wrapped in wax paper, 1 hour, or until firm enough to handle. 4. On a lightly floured sheet of wax paper with a floured rolling pin roll out dough into a 13- by 10- inch rectangle, about 1/3 inch thick. Drop fig mixture by spoonfuls onto dough and gently spread an even layer over dough. 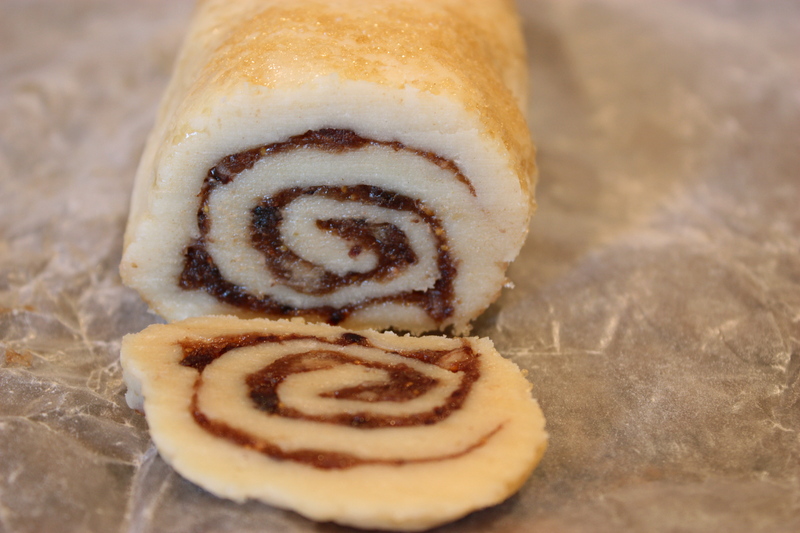 Starting with a long side, roll dough jelly-roll fashion into a 13-inch log, using wax paper as a guide. Roll log in raw sugar to coat. Chill log, wrapped in wax paper, 4 hours, or until firm. 5. Preheat oven to 350° F. and lightly butter 2 baking sheets. Cut log into 1/3-inch-thick rounds and arrange about 2 inches apart on baking sheets. Bake cookies in batches in middle of oven until pale golden, 12-13 minutes, and transfer to racks to cool. 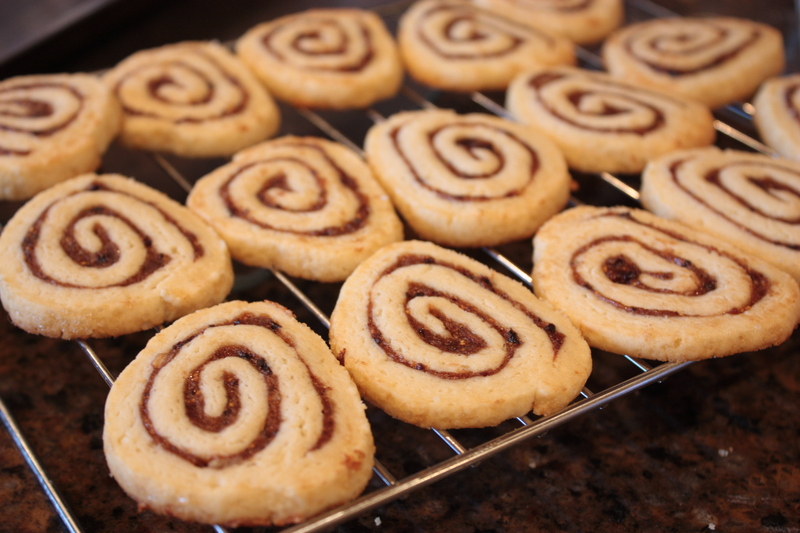 This entry was posted in Sweet and tagged anise-scented fig and date swirls, cookie swap, Cooking, fig cookies, food, recipe by needtotaste. Bookmark the permalink. Hi fellow foodie Allison! These look great, I’m glad I could inspire you! Looks like a fab swap. Happy Holidays! Happy days to you too!